Choosing the best air compressor depends on the nature of the project you are working on. You can use air compressor to power nail guns, drills, spray guns, sanders, or inflate pool toys. Most homeowners settle for the compact, portable and easy to operate air compressor model, and certainly for a good reason. Many average homeowners do not own heavy duty tools that would require high operating power. However, different air compressors come with different specifications, hence their strengths and weaknesses differ from each other. As such, other than looking at performance alone you need to consider other important factors, such as reliability, build quality, costs, life span, and design among others. A typical air compressor should have basic features such as shrouding for protecting the internal delicate parts of an air compressor, ball valve drain for getting rid of excess water that can collect inside, a cord wrap, multiple outlets, and a thermal overload switch to prevent overheating. An air compressor can either be operated with an electric power or fuel. Both fuel and electric operated air compressors have their own pros and cons and you need to make an informed choice before settling for your preferred choice. You can choose a unit that produces low, medium, or high pressure output based on the task you want to perform. A low pressure output air compressor discharges pressure that ranges between 125 to 150 psi and is suitable for inflating bike tires, balloons, and cleaning electronic equipment. Medium pressure output air compressor discharges pressure that ranges between 150 to 1000 psi and is suitable for sand blasting, inflating car tires, and spray painting, while a high pressure output air compressor produces pressure above 1000psi and is used for industrial purposes. 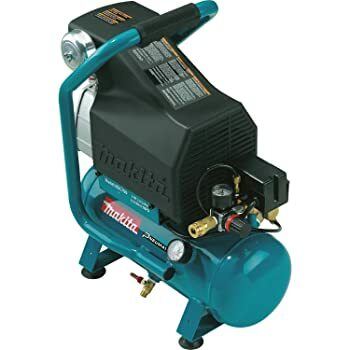 When it comes choosing an air compressor, be sure not to base your choice entirely on the price that won’t burn a hole in your pocket but on its other features as well. For example, air compressors that are loud won’t be appropriate in a residential area compared to the seamlessly quiet models available today. As there are many factors to put into consideration before getting an air compressor, we put together this list, to help you make up your mind and get the best compressor to answer your needs. 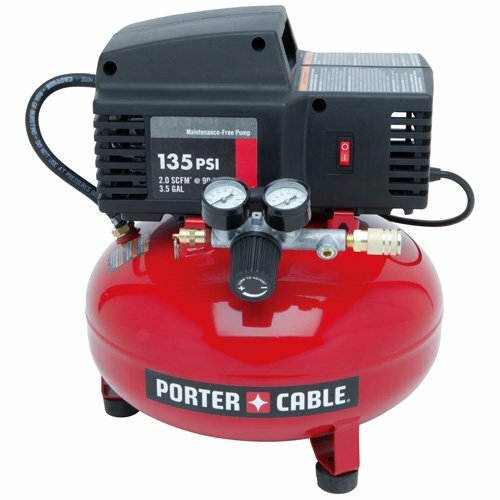 PORTER-CABLE PCFP02003 3.5-Gallon 135 PSI Pancake Compressor is one of the best air compressors that won’t cost you too much, while still delivering great work. And the best part? It is the lightest air compressor, weighing only 26 pounds. It’s one of the most portable air compressors you can find on the market today. Equally, its size and shape does not disappoint as it’s small, making it easy to store or carry it around. Safety- This air compressor comes with clear and detailed operating instructions. When you buy one of these air compressors it has instructions on how to unpack it, how to check its relief valve by easily pulling on the ring, how to plug in to a power source, and finally how to turn it on. When these instructions are carefully followed chances of any accidents are slim to none. Performance– It has 135 PSI discharge that is of course on the lower side but its quick recovery time seems to make up for the small PSI. Although it has a low amp 120 voltage motor, this small portable machine is really efficient as it produces good power and requires little maintenance. It is operated with an electric power and just like all great air compressors it is an oil free pump hence durable. If by any chance you live in a cold place or need to use this air compressor in winter, you shouldn’t be worried about starting this machine as its guarantees to start up almost instantly. Cost and refund policy– Its warranty policy is not the best, since you can’t get broken parts easily replaced. This might help to explain why it’s relatively low cost. 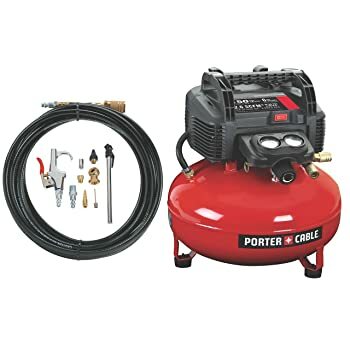 Nevertheless, it still can be a good choice for an air compressor as it comes with premium features such as a double gauge as well as quick connect couplet. 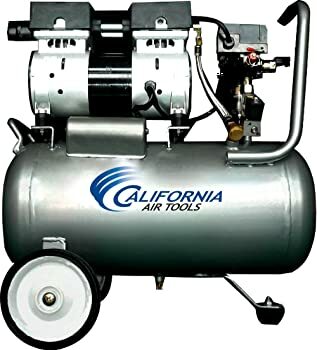 It is the size of tank, a 3.5 gallon and the air delivery of 2.0 SCFM that is delivered through a 90 PSI pump that qualifies this air compressor for small projects. It can effectively support small roofing jobs, trim finishing nail jobs, general inflation of toys or bicycle tiers, and for small size SCFM air tools. This machine is the one of the noisiest compressors, as it has an 82 dDA level, comes with no accessories, and the regular need to replace the manifold plastic that holds the pressure. Some factors to consider. This is yet another outstanding air compressor from DeWalt that has some great features. 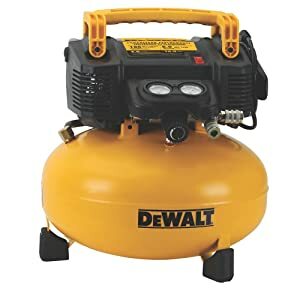 DEWALT DWFP55126 6-Gallon 165 PSI Pancake Compressor comes with a pocket friendly price. It is also relatively light weight with 30 pounds, and even though it is small in size it has a reputation of a unit that jets an impressive punch. Safety– For DeWalt, safety seems to come first. Other than this air compressor coming with a complete guide on how to use it, it comes with premium features that give it an edge over the other models and at the same time enhance safety. For instance, the protective rubber leg covers prevent any chance of marring any surface it comes in contact with. It has convenient cord wrap that facilitates easy storage. Performance– It has an outstanding power output of nearly twice the power produced by other compressors of its size. You can start and run it effortlessly in cold weather due to a highly efficient motor, and even better – it comes with an extension cord. Maintenance– This air compressor machine is one of the easiest to maintain as it has an easy to remove console. For burden free ease of maintenance always remember to check if the drain valve is tightly closed before using the air compressor. Cost and Refund policy– DeWalt has a user friendly refund policy and is relatively affordable. It is easier to replace this specific product, should it break down. All in all, it’s truly an air compressor that you can rely on. It’s the 6.0 gallon tank together with the 165 PSI and 2.6 SCFM that are delivered precisely at 90 PSI, that enhances the performance of this unit’s performance.The unit’s really efficient regulator facilitates maximum performance of this air compressor. 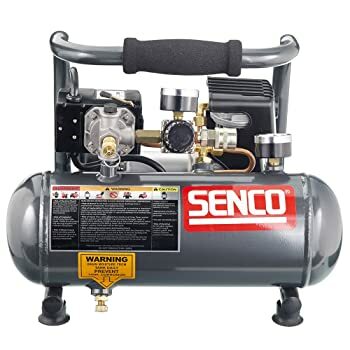 Although this product is classified among the portable air compressors we listed here, it is rather bulky and not so good to work with when you have to handle tasks that require you to move around a lot. With a 75.5 dBA noise level it is still considered noisy and not appropriate in a home environment. 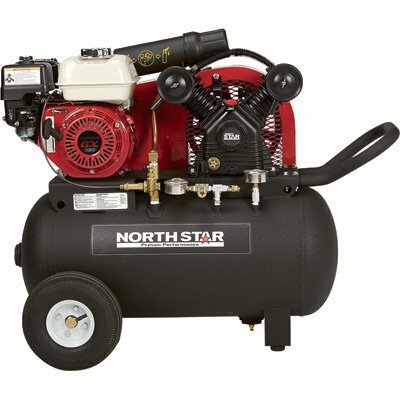 The NorthStar 20-gallon horizontal gas-powered portable air compressor is an impressive heavy duty compressor built with durability in mind. It has a single-stage pump made from full cast iron that is belt-driven. It has outstanding features that include a V-type cylinder specifically designed to provide superior cooling, floating steel valves to enhance its durability, as well as low vibration technology for exceptionally smooth and seamless operation. Safety-Your North Star has excellent safety measures that provide flawless performance for many years and guarantees safe use. The crankshaft is excellently supported on both sides with bearings on the two ends so as to minimize wear and tear. The best part is that it has unloader valve that can temporarily separate the pump from the tank pressure causing the engine to start safely and effortlessly under no load. 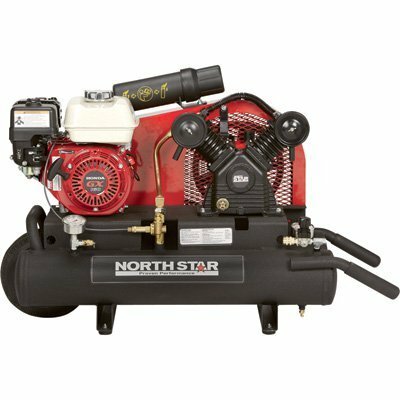 Performance– The NorthStar 20-gallon horizontal gas-powered portable air compressor is dependable, reliable, and can last for many years when well taken care of, as it is made from cast iron. The amazing low vibrating technology allows for smooth operation without the fear of breaking it down. It comes with an impressive 163 cc 20 gallon tank engineered to eliminate hot spots and provide superior cooling effects. Cost and refund policy– You may have to pay more than your regular air compressor, but it also come with a great user refund policy. In case of any default, you can replace your air compressor without much hustle. It uses a Honda GX160 OHV engine with 4.8 horse power at 3600 rpm that has high fuel efficiency, and operates with a lot of ease. Besides, the engine delivers 13.7 CFM for every 90 PSI. The unit’s noise level is not so great but is regarded as quieter, compared to other air compressors of its size. It sounds more or less like a 6000 watt generator. We also feel that an NPT outlet should have been used, so as to allow more air as well as strength rather than the currently used ¼ NPT outlet. This air compressor unit is belt-driven and has a two stage pump made from cast iron. Whenever you need to preform a considerable job, this would be a highly recommended heavy duty air compressor. The unit has a 30 gallon air compressor that is positioned on a horizontal level to enhance its capacity. Safety– This air compressor unit has a full cast iron for added durability and safety as you perform your task. In order to prevent over-heating, it is fitted with a v-style cylinder and a floating steel valve. Its low vibration technology offers stability, even when the machine handles even challenging tasks. Performance– The unit’s Honda engine has low oil shutdown as well as a charging circuit. The pump head is forged and is designed from durable FC35 cast iron. Additionally, the unit is engineered to run at a slower RPM so as to reduce wear and tear and keep it cool. The unit has a 100% duty cycle with its pump running at 1300 rpm and being in a position to deliver 24.4 CFM at 90psi. Cost and refund policy– This is a mid-priced compressor unit that comes with an amazing 5 year warranty. It therefore means that if your compressor breaks down along the way you can easily get it replaced. Other modifications that have been introduced into the unit to keep it cool and enhance performance include the provision of an oversized flywheel, an overlapping piston ring to maximize compression and piston wrist pins to provide high pressure. The bottom line is that this air compressor is great and suitable for heavy duty tasks. If you find it cumbersome to use the pay-per-use pressure pump at your local gas station, you may consider getting your own air pump. 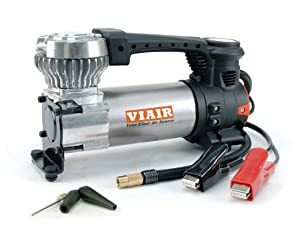 Viair 00088 88P Portable Air Compressor might be a good option for you, as it provides an excellent balance between cost, power output, as well as size. Not only does it fit in the trunk of your car, but it also connects to your car battery through the lighter socket, for easy use. won’t have to worry about the slack in the power cord and air hose since it is packaged with a 10 feet long cord together with a 16 feet long air hose. Cost and refund policy– This product is cheap and long lasting. The refund policy is not great, since you may need to replace parts yourself when they are damaged. Even though it doesn’t come with its own carrying case, it still is a great air compressor for light inflating tasks. It’s a really portable air compressor that only weighs 4.5 pounds. This unit is only 10x6x6 inches and can be nicely rolled and shoved into a small box. Better yet, it has a strap that you can use to safely secure the power cord for efficient storage. 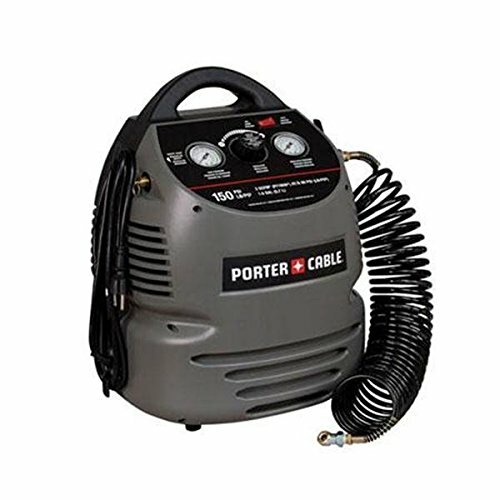 This user friendly air compressor is a mid-price transportable unit that has a 150 max PSI. you can rest assure that this machine, complemented with a 13-Piece accessory kit will provide a long run time. Safety– Just like all other great air compressors, this one comes with a manual indicating how the unit should be operated. However, it doesn’t clearly explain how to start using it, particularly for first time users. After unpacking the unit, we recommend that you first ensure the switch is on the “off” position. Secondly plug the source of power to an appropriate socket, and lastly fully open the drain valve to avoid pressure building up in the tank. If you follow these instructions carefully, you shouldn’t have any problems. Performance– The 6 gallon tank operates with a 120 volt motor and provides good power to undertake various tasks. It has replaceable brushes that extend the lifespan of this air compressor. The 150 psi tank can store considerable air pressure that you can use for a long period of time. It’s also good to note that this air compressor comes a with 13 piece accessory kit. Cost and refund policy– It’s a mid-price air compressor but it’s worth every penny you spend. It comes with a one year warranty. This is a great unit that can effectively handle most the work that would require the service of an air compressor, even though the user instructions could be better. The unit is equipped with a highly efficient oil free-pump that hardly requires any maintenance. One outstanding feature of the unit is that it has plug and air coupler that is factory installed directly on the air hose so as to prevent leaks and save excessive hassle. The unit cannot be classified as an ultra-quiet air compressor, but it’s neither excessively noisy. You can use it without much worry of splitting your eardrums wide open. This 2.6 gallon tank air compressor unit can excellently provide required air pressure without the fear of it breaking down. It has a toughened big bore cylinder with equally big and highly effective piston for outstanding performance. Makita MAC700 Big Bore 2.0 HP Air Compressor’s pump of 1729 RPM provides unmatched preformance even when the unit is running on lower RPM. Safety– The unit is engineered to provide great performance with lower RPM, so as to keep any breakage to a minimum, as well as premature motor failure coming as a result of voltage drops. Besides, it’s a safe air compressor that is designed to operate flawlessly with maximum power output. The roll bar handle embedded in this unit does an incredible job, as it not only enhances portability but also provides protection for the unit. is built for. The pump is oil lubricated with automotive style fillers facilitating increased intake of air for exceptional efficiency. Equally, the 2.6 gallon tank is engineered to sustain a 130 PSI internal operating pressure and delivers 90 PSI at 3.3 CFM and 40 PSI at3.8 CFM, respectively. Cost and refund policy– Makita MAC700 comes with a one year warranty and the cost is not way over the roof. Having said that, we feel that it’s a great air compressor unit. The increased compression of this unit does not compromise the noise level as it is extremely quiet, and as such can be used in a home environment. It is compact and energy efficient and yet its strength and power is not a subject for question. It is efficient and highly reliable. The only problem with the pressure switch, is that it is not really durable – it somehow gets detached or along the way. Although it’s not possible to get this pressure switch replaced as they are not independently manufactured, you can use other similar pressure switches from other brands. This unit is ultra-light, comes with a really low price tag and is built to handle small tasks. One outstanding feature of Senco PC1010 1-Horsepower Peak is that it is extremely quiet with a stunning 73 dBA. The unit is designed to run at an appropriate horsepower in order to accomplish tasks effectively. Its upper limit though is 1 horsepower. Safety– Senco is reasonably designed to provide maximum safety as you undertake various jobs. It is portable and ultra-light and thus can be carried around with little effort. Equally, it has a great instruction manual that comes in handy, particularly for first time users. Performance– This product is a 1 HP compressor unit that can comfortably handle small to medium tasks such as nail framing. The 1 gallon air tank sustains 125 psi internal pressure with a maximum output of 120 PSI. The motor operates on 4 amps at 115V. This compressor can go from 0-120psi in approximately 128 seconds. It comes with premium accessories such as ¼ quick disconnect coupler and pressure gauges for both the tank as well as the output pressure. Cost and refund policy– This unit is cheap but surprisingly, can handle quite a number of things around the house. The one year warranty is reasonable and we feel that it’s a great unit for small home based work. What we didn’t like about this product is the lack of sufficient punch power. It is a significant limitation that keeps many from going for this air compressor. It is primarily designed for home jobs and not for industrial heavy duty tasks. This product has a fully shrouded 1.5 gallon tank that can be moved around easily at your work station. It has an excellent compressor recovery time as it runs a 2.0 SCFM that operates at 90 psi. You will not struggle with drainage, as it comes with rubber feet and an efficient water drainage valve. The best part about this product is that it is pocket friendly as it is rated as one of the lower cost compressor units. Safety– The unit is well built to provide maximum safety and impressive performance as compared to other air compressors of the same size. Though it comes with a list of accessories, we noted that they are of low quality, which in the long run can lead to some leakage. Performance- As indicated, the 1.5 gallon ultra-light and portable air compressor unit weighs only 20 pounds. It is engineered with an efficient 120v motor that can run well even in cold weather conditions. It has an oil free pump that is durable, as well as a shrouded gallon tank that maintains a 150psi maximum internal pressure for a considerably longer tool runtime. Cost and refund policy- Warranty is considerably good with a 1 year warranty plan. The best part with this unit is its cost. It’s a real treat for anyone who wants to accomplish medium level work such as using a stapler, brad nailer and pin nailer, while saving money with a low price tag. We didn’t really like the noise level of this unit. Although a 79 dBA might be considered tolerable, it’s certainly not favorable for residential home based work. The parts that come with this compressor unit are of low quality, which can compromise the full functionality of the compressor unit. As expected, due to low horsepower it only accomplishes small to medium jobs. This compressor has an ultra-quiet working unit that can be transported easily around your work station as it only weighs 49 pounds. This model is highly recommended for home use as you can hardly notice the 60 decibels air compressor unit. The oil free pump is effectively driven by the 1 horsepower running and 2 horsepower peak 110V motor. The 6.3 gallon tank, which is horizontally positioned with wheels helps sustain an internal air pressure that can last for a considerably longer runtime. Performance- This unit is ideal to work in an environment which requires being quiet, such as in a learning institution. Further modifications made to this air compressor in order to make it truly silent include keeping the rotation per minutes to 1680 RPM, which also serves for less wear and tear. Cost and refund policy– This product is a low cost air compressor unit which has a one year warranty. Since it is built with durability and reliability in mind, you might really not get the chance to use this warranty. That said, this is a great air compressor unit, ideal when one requires to work in an environment with absolute silence. The steel tank is designed to provide additional air for a longer tool runtimes. The things we didn’t like about this unit is that is it can only handle relatively light tasks, produces a strong unpleasant smell when in use, and has a longer refill time. However, considering it’s a powerful yet portable unit, you just have to love this product. After reviewing some of the best air compressors out on the market nowadays, there are some general rules of thumb that you should keep in mind when considering which product to buy. PSI- A compressor with a higher Pounds per Square Inch (PSI) would be ideal as it takes less time to refill the tank. When a compressor with a bigger tank to refill has a low PSI it causes unnecessary stoppages, and can result in longer work times. As a result, professionals who operate big industrial machines and need the compressors for heavy duty jobs, always opt for higher PSI, so as to be able to work continuously. Tank size- It’s quite obvious that a smaller tank has a smaller tool runtime, while a larger one has a longer tool runtime. Therefore, air compressor units with small tanks would be better suited for home jobs, while larger ones are suitable for re-modelling projects, or other more heavy duty work. Just make sure that the tank capacity that you settle for will suit your needs, so that you can work continuously. Decibels- A unit with a lower decibel level (preferably the ultra-silent models) are suitable especially for working within a home set up. Pay attention to how a unit is built. Poorly build units produces a lot of noise despite their size. Small but poorly built units can be a lot louder than larger, higher quality units. Always opt for the quieter models. Weight- The lighter a compressor is the better it is to carry around. Units that have sufficient power output for your needs and are light and portable are highly recommended. When looking for a portable unit, opt for the one that have wheels. Accessories- A machine that comes with many accessories does not necessarily imply that it is better than its competing products, which come with fewer accessories. What you should look out for is the quality of the accessories as well as the accompanying price tag. Remember that poorly built accessories can cause leakage and make the job much harder than it really is. As always, there is no one BEST product. What will determine the quality of any tool you use, is that it suits your needs, and gets the job done with the least possible hassle. So shop wisely, check the products technical specifications carefully and you will surely find a unit that is good for you.